TO DRINK Chinese green tea, followed by Japanese sake. For the pastry, place the flour on a working surface and slowly incorporate the water to form a dough. Knead until smooth. Make each filling in a separate bowl by simply mixing all the ingredients together until well combined. Refrigerate for 2 hours. To assemble the dim sum, roll the dough into a long cylinder shape and divide it into 20 equal portions. Flatten a piece of dough into an oval disc with a knife, place 5ml (1 tsp) filling on top, then seal up tightly. Shape as desired and repeat for each piece of dough. 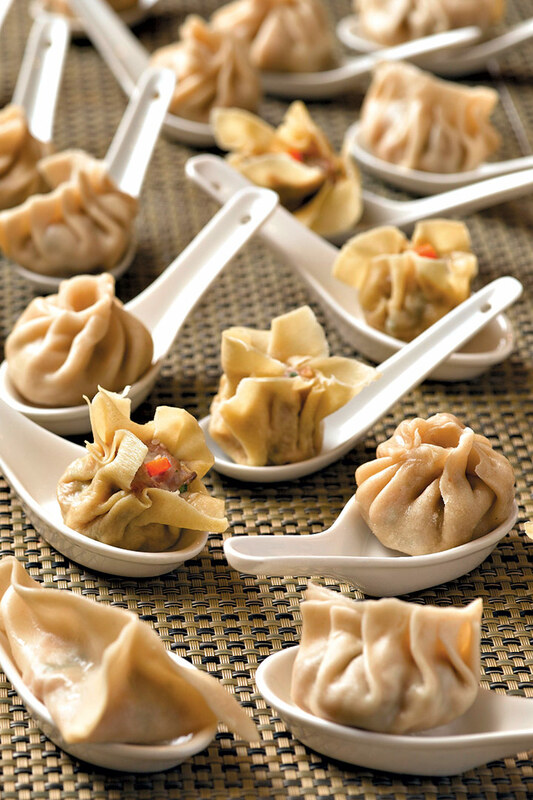 Arrange the dumplings in a greased steamer and cook for 6 minutes on high heat. Serve hot with soy sauce and balsamic vinegar for dipping. If you’re in a hurry you can use the filling immediately, but it is better if chilled first. If fresh shiitake mushrooms are not available, use the dried version, but soak them first to rehydrate.